Let us now consider the other side of the risk-management equation: We have so far focused only on the cost of climate change, including the cost of adaptation measures (e.g., to put your beach front home on stilts). It is time to consider the cost of mitigation and how that is affected by uncertainty. Mitigation means that we seek to reduce the damages from climate change by reducing carbon emissions. This is quite possible but it doesn’t come for free: We need to decarbonize our economy by converting to alternative sources of energy, and this clearly involves an economic cost (in addition to the new job opportunities that come with conversion to a new economy). So how does this cost relate to uncertainty about the climate? How does greater uncertainty affect the cost of mitigation? To answer this question, we need to deal with a few preliminary considerations. First, we need to realize that to stabilize atmospheric concentrations of greenhouse gases, our current emissions have to tend towards zero. Just cutting 5% or 10% as suggested by political leaders (at best) will achieve nothing. This fact is illustrated in the figure below, and the underlying reasons are outlined in detail here—if the figure below does not make sense, then you should revisit this post before reading further. It is clear that all lines tend towards zero sooner or later, and it is clear that the more we want to limit the budget, the steeper and the sooner the required emission cuts. Without going into details, it should be self-evident that steeper cuts translate into greater economic cost—cutting emissions by 5% can be achieved by efficiency measures; cutting them by 50% in a year requires that roughly half your factory is turned off. The figure makes two points: First, the longer we wait, the steeper the required emission cuts. Second, if we wait till 2041 to commence mitigation, we would have to decarbonize the world economy overnight. Needless to say, this is technologically and politically impossible. This absolute boundary exists for any budget, no matter how large, it’s only the time at which it is hit that differs between budgets—in the same way that no matter how much money you have, at some point you will have to stop spending because you are out of cash! It is important to establish the existence of this absolute boundary because then the economic discount rate ceases to matter. What is the discount rate and why would it matter? The discount rate is used by economists to balance future costs against current expenditures. For example, should I spend $1000 today to fix something that will cost $2000 to fix in 10 years time? Perhaps, but what if the future cost were only $1250? After all, in 10 years time we expect to be far wealthier than now, and $1250 then may appear to be pocket money whereas $1000 now feels like a lot of money. In a nutshell, the discount rate determines by what percentage we reduce the cost of future expenditures to make them commensurate to today’s dollars. In the context of mitigation, the discount rate matters because it could be argued that even though delayed mitigation is more costly than cutting emissions now (because steeper cuts are required), those delayed (greater) expenses are not “worth as much” as today’s costs because they are discounted. Given a (very) large discount rate, one might therefore be tempted to argue that mitigation should be delayed until 2021, because even though this will increase costs, the increase is compensated by the delay. Although the required discount rate would likely be large, it cannot be dismissed. 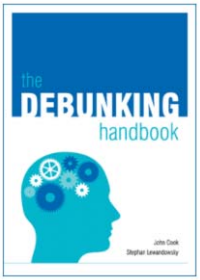 Indeed, Weitzman (2007, p. 705) noted that “…the biggest uncertainty of all in the economics of climate change is the uncertainty about which interest rate to use for discounting.” It would therefore be preferable to remove this source of uncertainty. Fortunately, the discount rate and the uncertainty surrounding it, ceases to be relevant when we reach the absolute boundary in the above figure, at which point it no longer matters by how much we discount future costs. Decarbonizing the economy over night is impossible, and switching the world economy off is inconceivable, and those two facts are not subject to discounting. 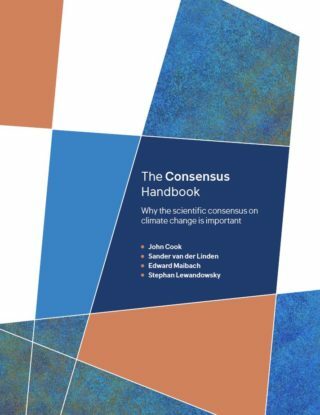 It follows that to examine the impact of climate uncertainty on mitigation, we should focus on an absolute boundary that is not subject to arguments involving a discount rate. To relate climate uncertainty to mitigation, it is helpful if we first consider the relationship between total carbon emissions and the expected peak temperature increase. This is shown in the figure below, which is produced using the equations provided by Raupach et al. (2011). 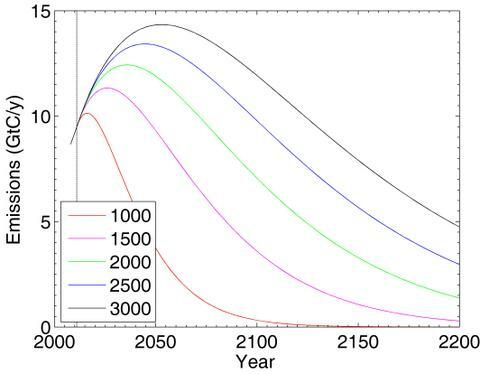 The figure shows that to keep warming limited to 2°C—the maximum considered “safe” by scientists—we must limit cumulative emissions to around 1,000 Gt. This explains why I used a budget of 1,000 Gt in the earlier figure: If you look at it again, you can see for yourself how urgently we have to embark on mitigative action. I again used the variance in our estimate of climate sensitivity as an indicator of uncertainty—if you are unclear about what that means, refresh your memory here. I again assumed that the uncertainty surrounding climate sensitivity has a fat-tailed lognormal distribution (cf. Roe & Baker, 2007). I varied the variance—and hence uncertainty—of that distribution from minimal to quite large without changing its mean. At each level of uncertainty, I drew 1000 samples from the sensitivity distribution and computed the carbon budget that would limit warming to 2°C. In other words, I translated the uncertainty in climate sensitivity into uncertainty about the budget that we had left to spend. The results are shown in the figure below and are worth exploring in detail. Consider the top panel first. 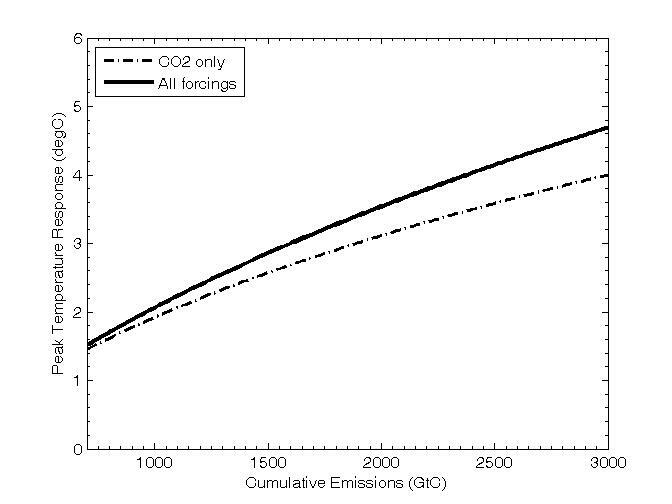 The blue line plots the mean carbon budget (across the 1000 samples) as a function of the uncertainty surrounding climate sensitivity (for this demonstration, climate sensitivity is expressed in units of KW-1 m2, with a mean of .741 and variance as shown in the figure above. This value corresponds to a sensitivity of 2.75°C in response to a doubling of CO2, which is right around the best estimate). When uncertainty is minimal (left-most blue data point), the expected budget is around 1000 GtC, which is precisely the value that in the earlier figure gave us 2°C peak warming—as it should be because we are examining budgets to limit warming to 2°C. 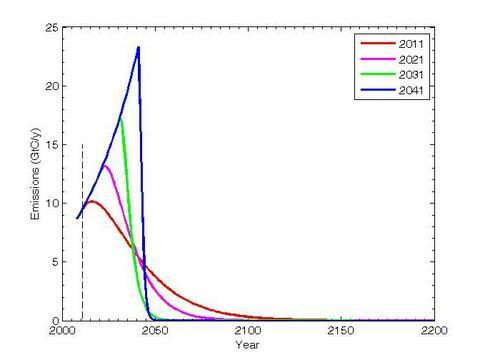 When uncertainty increases, the mean total budget also increases with uncertainty (other points on the blue line). That is, the greater our uncertainty about climate sensitivity, the greater the expected (average) carbon budget that we have available to limit warming to 2°C. This is good news, at least at first glance, because it means that greater uncertainty might give us greater leeway. However, that is not the complete picture, because what is relevant in this instance is not just the mean (average), but also the remainder of the distribution of carbon budgets: Remember, I sampled 1,000 possible actual sensitivities from a distribution, each of which is associated with an actual carbon budget—we therefore are now dealing with a distribution of possible budgets, and the shape of this distribution describes how likely those various budgets are. The remaining lines in the top panel of the figure describe the shape of this distribution by plotting its median (i.e. the point that divides the distribution into an equal number of observations, such that 500 are above and another 500 below that point), its 25th percentile or quartile (labelled Q25, referring to the point that has 250 budgets below it and the remaining 750 above), and finally its minimum. The latter is particularly important because it tells us what the least (and hence most constraining) carbon budget is that we may encounter at a given level of uncertainty about the climate. The figure shows very clearly that the minimum budget decreases as uncertainty increases, before it flattens out as it hits the horizontal dashed line. What does this mean? It means two things: First, as uncertainty increases, the worst-case scenario—namely, the lowest possible carbon budget that we may have available to limit warming to 2°C—becomes worse. Second, and even more worryingly, the worst-case scenario rapidly hits an absolute and inescapable brick wall. That brick wall is the dashed line, which represents the amount of carbon (346 Gt) that humanity has already emitted. In other words, as uncertainty increases, the worst case scenario becomes the worst imaginable case—namely the case where we have to switch off our economy not only over night but to do so now. Needless to say, this is impossible. Now, one might argue that the worst-case scenario shouldn’t worry us too much, because on average greater uncertainty means that we have a greater carbon budget to play with. This argument, alas, overlooks the bottom panel of the figure. 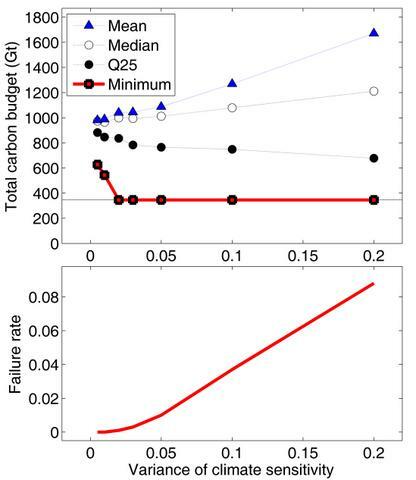 The bottom panel of the figure plots the probability of the carbon budget hitting that conceptual minimum. No carbon budget can go below that minimum—because we’ve already spent it!—but the number of budgets, out of the 1000 sampled, that hit the minimum varies with uncertainty in climate sensitivity. And the probabillity goes up as uncertainty increases. The number of worst-case budgets increases with uncertainty, from zero (if uncertainty is tiny) to more than 8% (.08), when uncertainty is large. To put this into context, that risk is more than 1,000 times greater than the risk of dying in a car crash in Australia (expressed as fatalities per 100,000 population). So not only does greater uncertainty put the worst-case scenario into a very bad spot, it also increases the likelihood of that worst-case scenario being true. In a nutshell, increased uncertainty means that the likelihood of us having to turn off the economy overnight right now, goes from zero to a non-negligible 8%. Would you still drive your car if the risk of a crash went up from its current level by a factor in excecss of 1000? Hint: That means more than 1,600,000 Australians would die every year in car crashes. 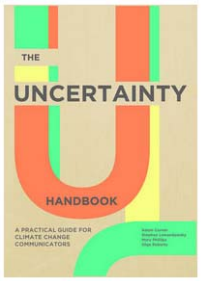 So no, uncertainty is no one’s friend, whether we talk about damages from climate change or the costs of mitigation. There is no escaping those simple mathematical facts. There is only one way to escape that uncertainty: Mitigation. Now. Raupach, M. R.; Canadell, J. G.; Ciais, P.; Friedlingstein, P.; Rayner, P. J. & Trudinger, C. M. (2011). The relationship between peak warming and cumulative CO2 emissions, and its use to quantify vulnerabilities in the carbon–climate–human system. Tellus, 63B, 145-164. Weitzman, M. L. (2007). A Review of The Stern Review on the Economics of Climate Change. Journal of Economic Literature, 45, 703-724.